Electric paról for sale by the side of the road. 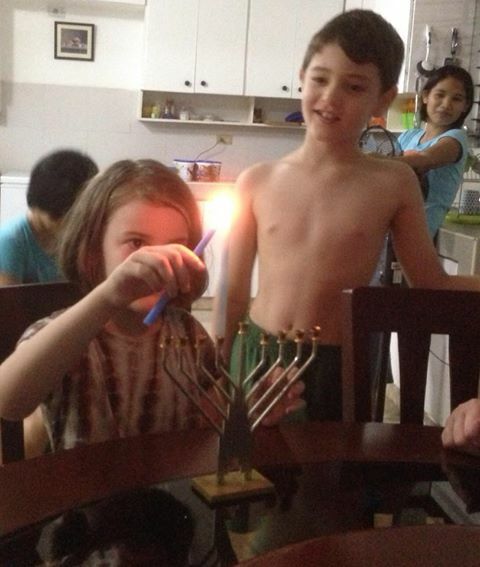 Chanukah came very early this year, even before American Thanksgiving. 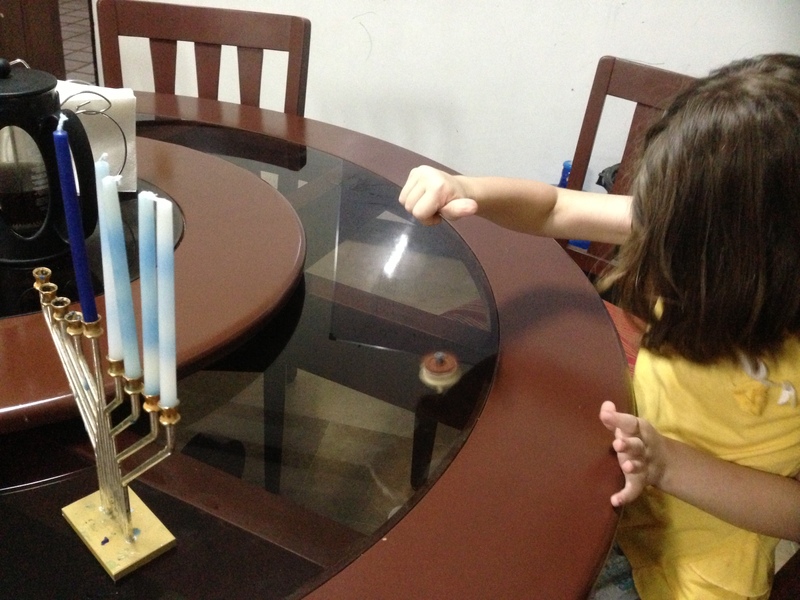 We brought Chanukah candles and a menorah with us to Davao, but somehow all our dreidels got lost in the move. Ever inventive, Isaiah (almost 8) managed to create a functional, spinning dreidel out of lego! Dreidel, dreidel, dreidel, I made it out of… lego! 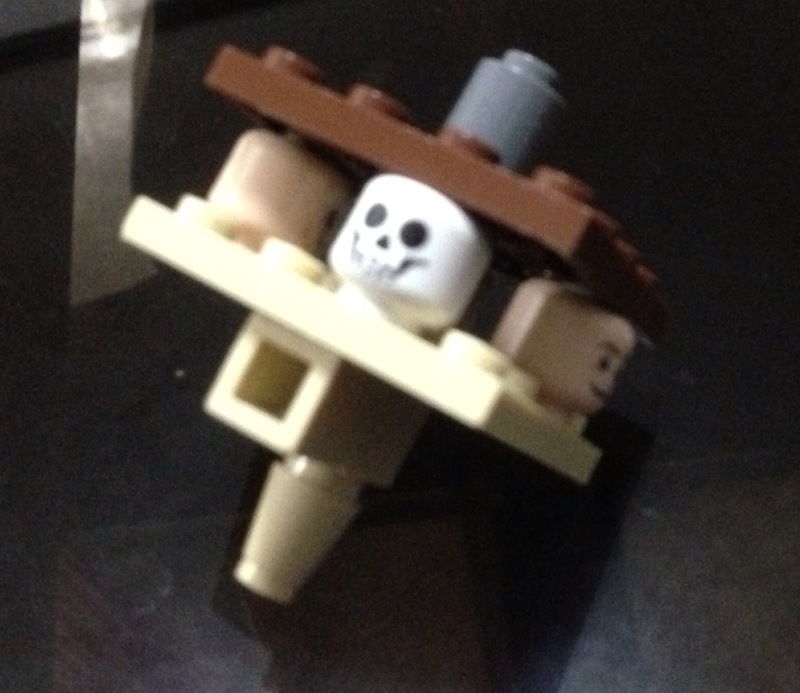 Instead of the hebrew letters, nun, gimel, hay, and shin, he used four lego-man heads: a smiling face, a “neutral” face, a frowning face, and a skull. We made latkes and applesauce, a rare treat since potatoes and apples are both expensive here. Actually, the cheapest potatoes are little marble-sized ones that would probably cost five times as much as the big baking potatoes in the states, but they aren’t so great for peeling and grating! 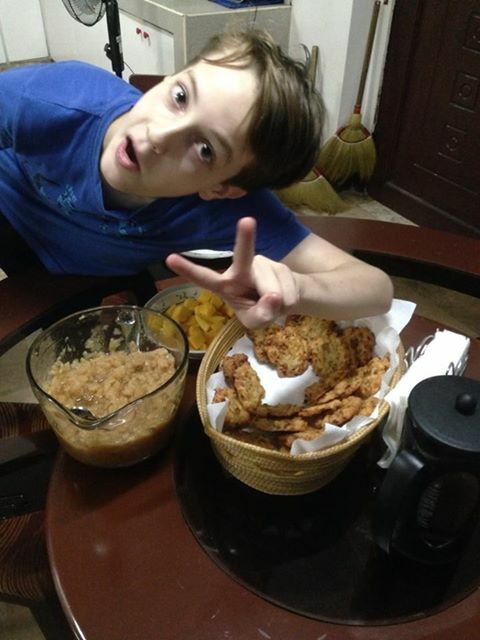 Ezekiel approves of the latkes. The missionaries associated with the birth center (over 60 of us!) all celebrated American Thanksgiving together with a big potluck. I volunteered to bring cranberry sauce — which I had seen several times in cans at our usual grocery store. I knew there would be a hefty “imported food” markup, but I neglected to plan ahead and consider that every expat in town would be buying traditional fixings the week before Thanksgiving and ended up hunting for several hours through multiple grocery stores until I finally found some, in glass jars packaged in the UK! 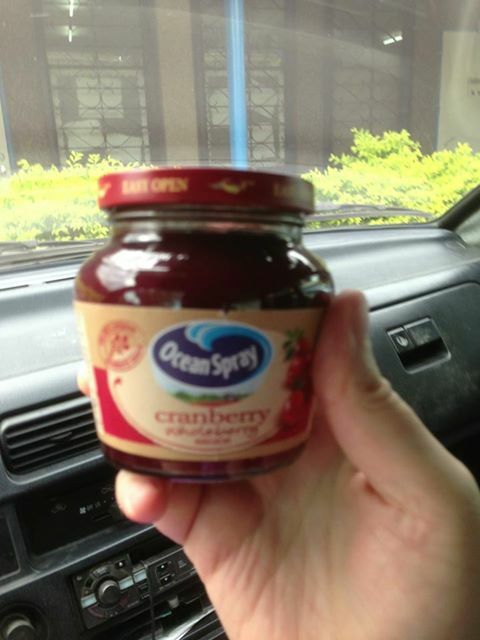 Cranberry sauce imported from the UK for American Thanksgiving in the Philippines! We’ve held off on decorating for Christmas so far despite the local feeling that the “the Christmas season includes every month that ends in -ber” but tomorrow we’ll be lighting both Chanukah and advent candles with the kids and putting up decorations. Hosanna is very enamored of the paróls and asks me buy one every time we pass one of the (many) roadside stands; we may need to adopt them as part of our family’s tradition even when we’re no longer in Davao. 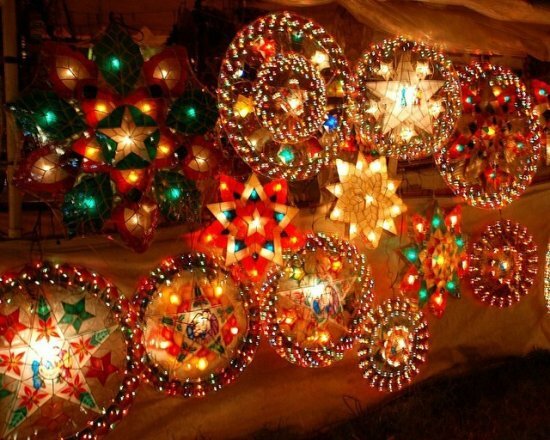 Even as we are celebrating and feasting we are very aware that just a few hundred miles north of us, millions of people have been displaced by super-typhoon Yolanda, losing family members, homes and livelihoods. Several of our friends have been or are currently involved in relief efforts in the affected areas. One writes, “everywhere looks like a bomb went off but great sense of positivity down here. People are really doing their best with the tiny bit they have.” The resiliency and optimism of the Filipino spirit is truly incredible. Please continue to pray for those affected by the typhoon and those working on relief and rebuilding, and give as you are able.